Y'all. We are only HOURS away from 2016! Can you believe it?? 2015 was a hell of a year. 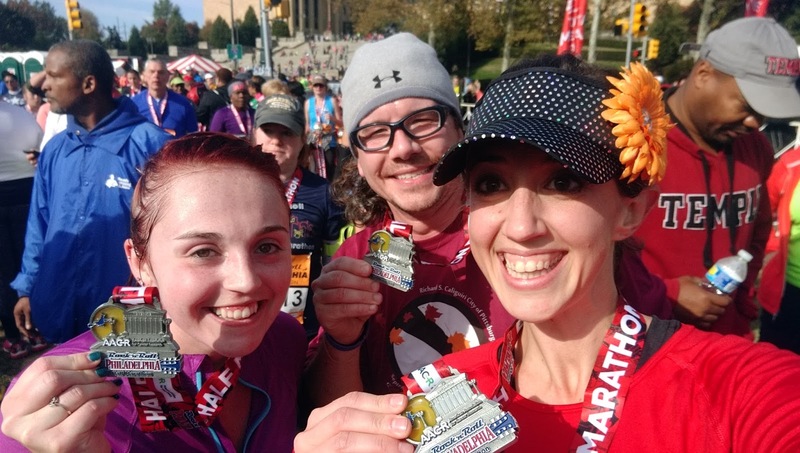 A comeback from injury... then having two additional injuries... then marathon redemption in Pittsburgh. Reaching goal and lifetime with Weight Watchers... then gaining a little back that I can't quite seem to get rid of. 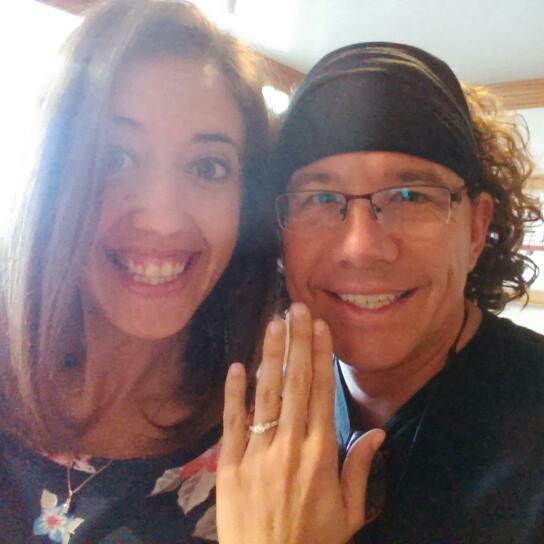 Getting engaged... then losing my job... then starting a new full-time and part-time job. 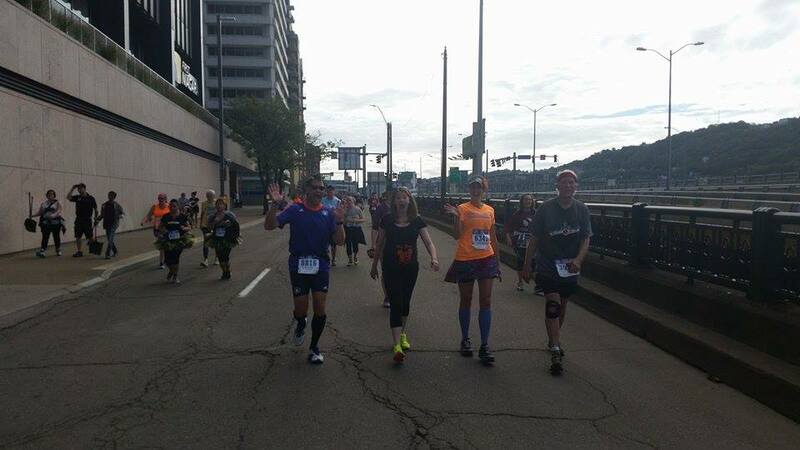 Finishing marathon number two... then my first DNF (did not finish) in Akron. 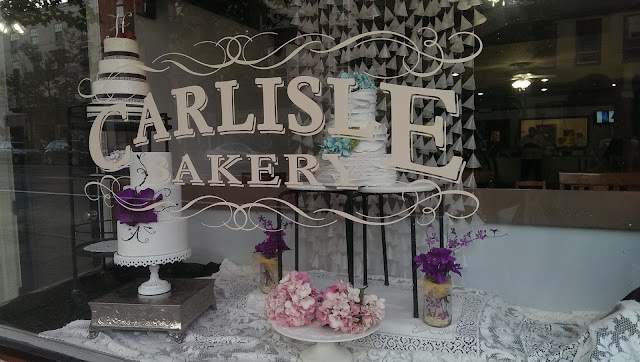 2015 brought lots of life changes for me- some incredibly awesome, some incredibly crappy. But- that's life, right? There's an old saying that I find myself focusing on when the crappy stuff seems to be taking over: "If it weren't for the valleys, you wouldn't appreciate the peaks." Instead of a content-heavy review, here's are some defining pictures from my 2015: the valleys, the peaks, and everything in between. 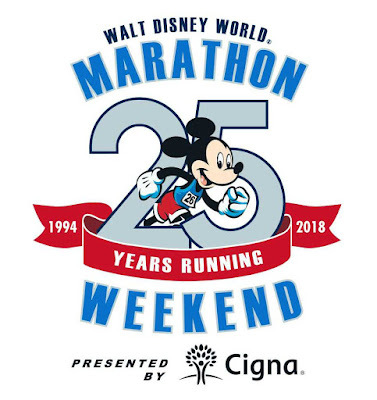 Finishing the Walt Disney World Marathon with my dad, cheering for Matthew and all the rest of our running Ohana, and spending time with our run Disney family was such a wonderful experience. 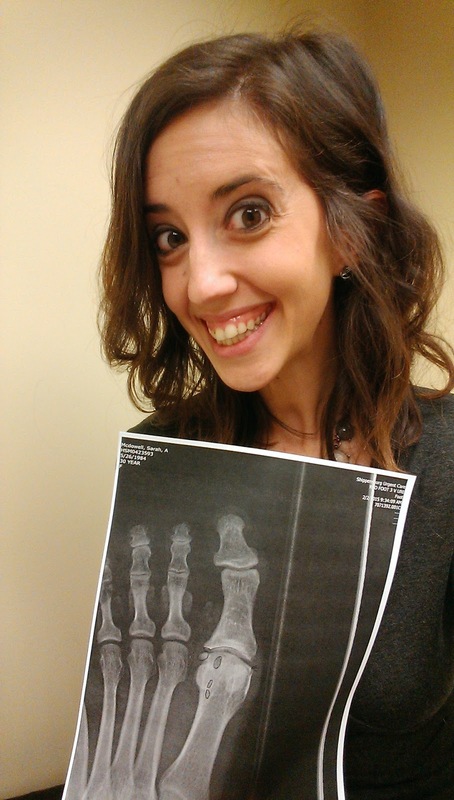 After dealing with excruciating pain in my left big toe, and being misdiagnosed with Gout, we finally figured out that arthritis was the culprit. Daily vitamins, activity, and yoga have helped me deal with this annoying injury. The Shamrock Half Marathon was special for many reasons including being able to run it with my younger brother Adam- it was his very first half marathon! 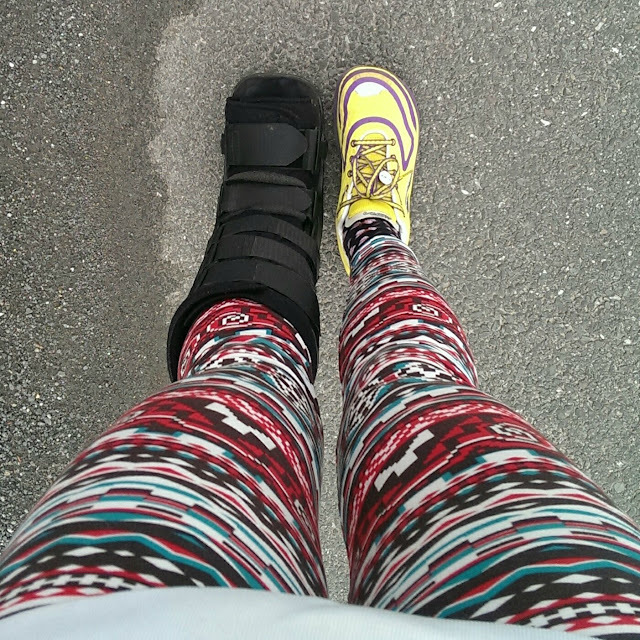 In the last few weeks of Pittsburgh Marathon training, my left ankle started to bother me- so badly that eventually I put myself into the boot for a few weeks. My doctors never did figure out what it was but [knock on wood!] it hasn't really bothered me since the marathon. 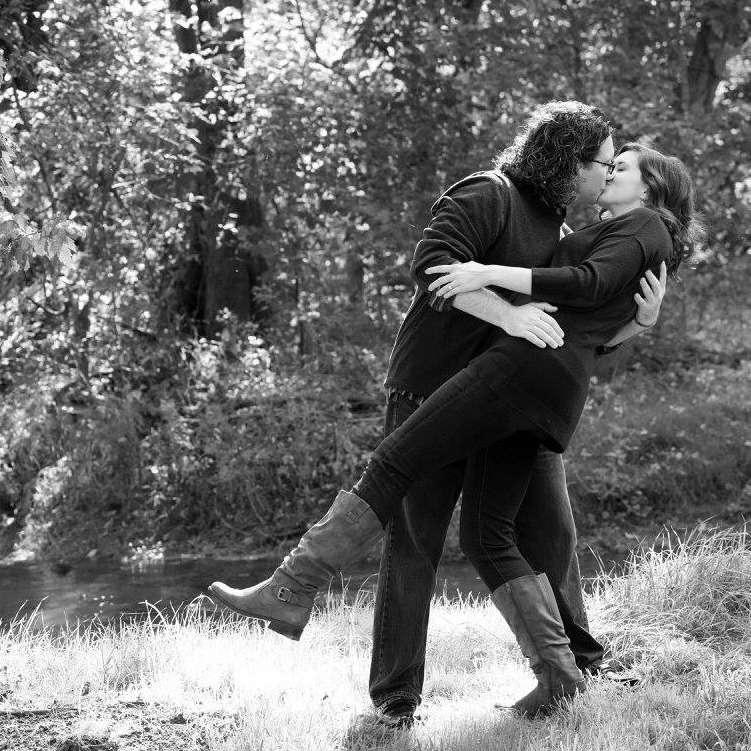 Mid-summer was full of wedding planning and signing contracts... not so much running. 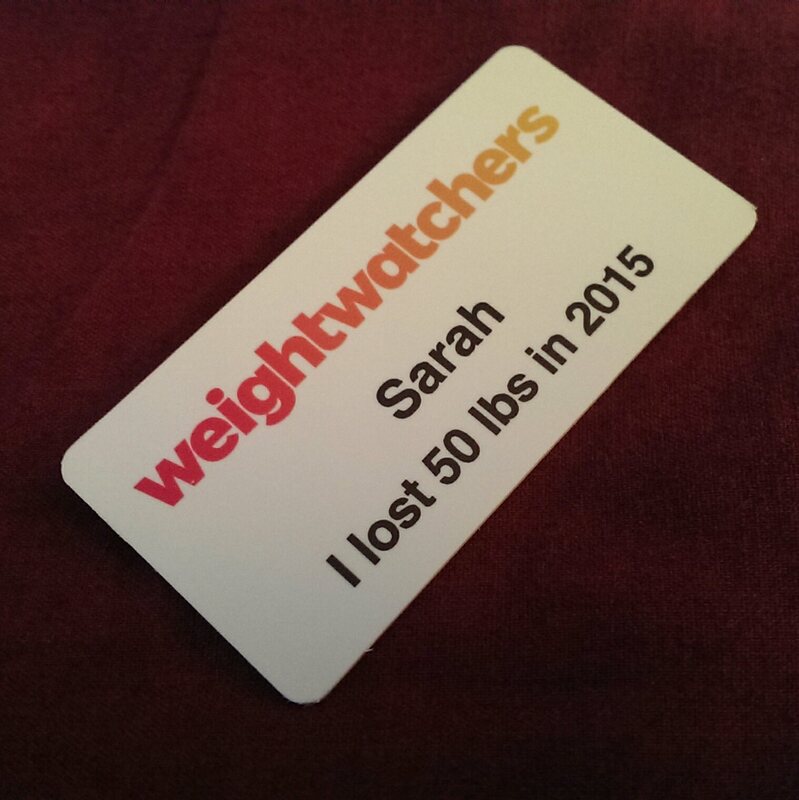 I finished my Weight Watchers training by the end of the summer and began working regularly as a receptionist at a local meeting. 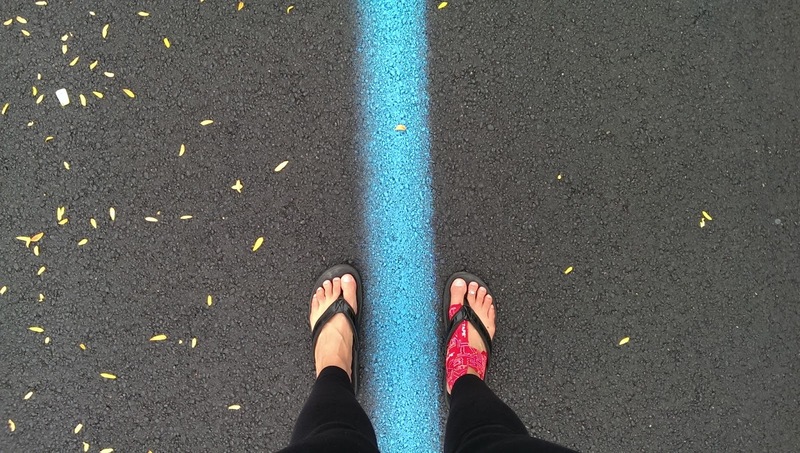 Due to unexplained foot pain, I did not finish the Akron Half Marathon aka, the Blue Line. Total bummer. Matthew and I ran the Rock and Roll Philly Half Marathon with our friend Cecilia and he paced us to her fastest half marathon ever! 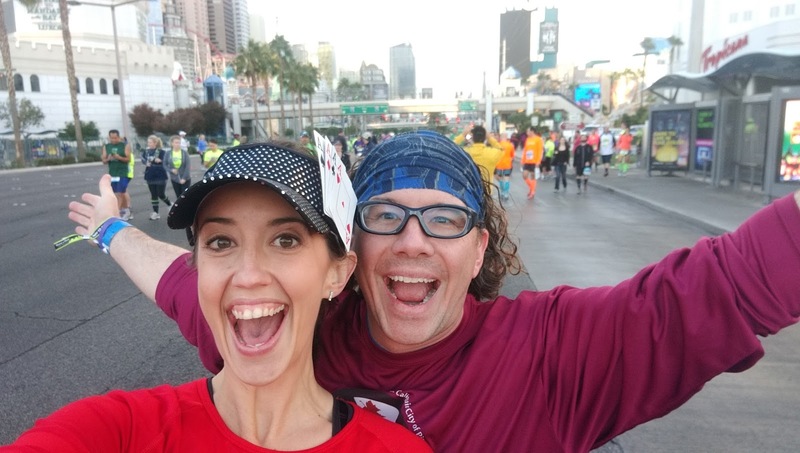 We conquered the #stripatnight and finished the Rock and Roll Vegas Half- despite 50 mile an hour winds and cold rain. Being surprised with a Christmas Disney Cruise? Probably my best December memory. All thanks to the greatest, sweetest, most thoughtful future husband in the world. With 2015 almost completely in the rear-view mirror, I am looking forward to all the peaks and valleys 2016 will bring. What was your most favorite "peak" from 2015? 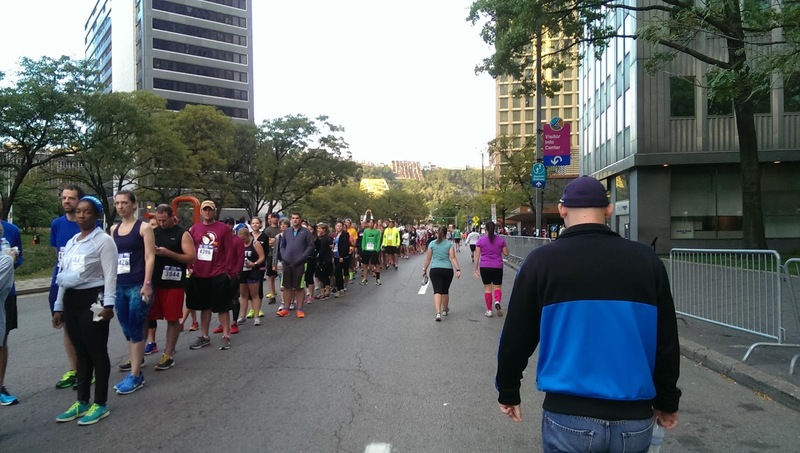 On a Sunday in late September, the great city of Pittsburgh holds an annual event: The Great Race. 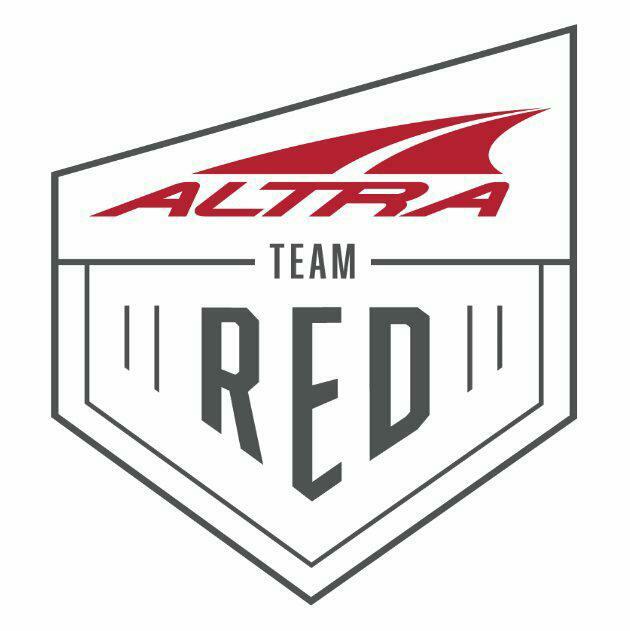 It is a race that's sponsored by the city, extremely large (10,000+ runners and walkers), and is a point-to-point, meaning the race starts in one area and finishes in a completely different area. 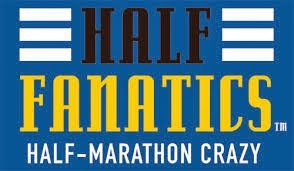 Last year, I was signed up for this event but wasn't able to participate due to my stress fracture. This year, I was determined to get my revenge on this course and finally complete it. And then my foot started acting up in early September. And I had my first DNF the day before the Great Race at Akron. Yeah- these races are back-to-back. Our wonderful friends put us up at their house in Pittsburgh the night of the Akron races- luckily Pittsburgh is only a two hour drive from Akron. So the night before the Great Race I was debating a lot on what to do. Should I start the race with a bum foot? 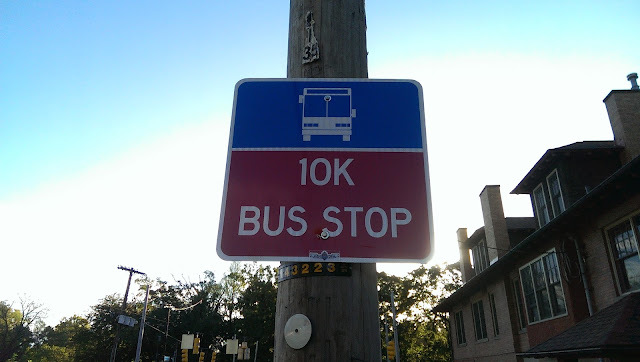 What if I had to stop- how would I get to the finish area? What if I walked the whole thing? Could I walk six miles? Would this hurt my foot even more? Was this a stupid decision to attempt this race? I decided to make a game-time decision: I would make the call at race time. The next morning, race morning, I got up and dressed and joined Matthew and our friends for the short drive to Pittsburgh. We parked downtown and joined the ever-expanding line to get on the shuttles to take us to the start line. 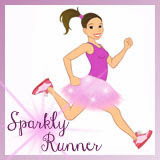 As we were walking, I heard someone yelling for "sparkly runner." It was a sweet blog reader, Elana! We chatted for a few minutes and grabbed a selfie. Then I went back to the end of the line with our friends and waited for our turn to get on the shuttle. Once at the start, we had some time to kill. There were a TON of people there and it was near impossible to get to the bathrooms- all of which had extremely long lines. 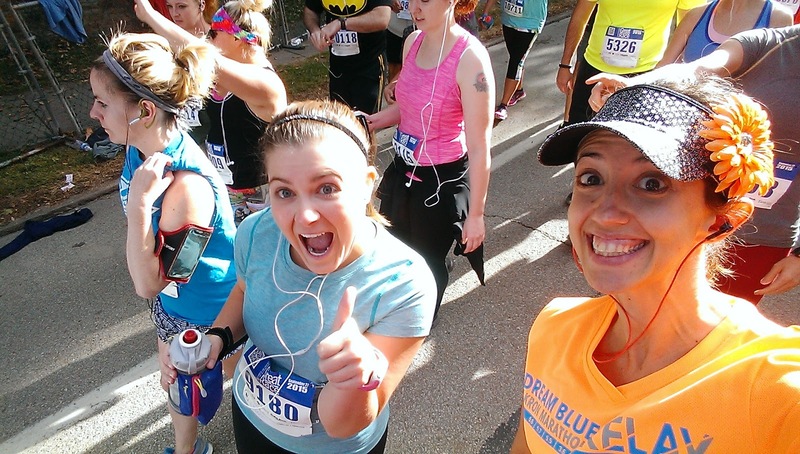 So, I went behind this little brick wall :-) I credit my love of running with my ability to pee anywhere! 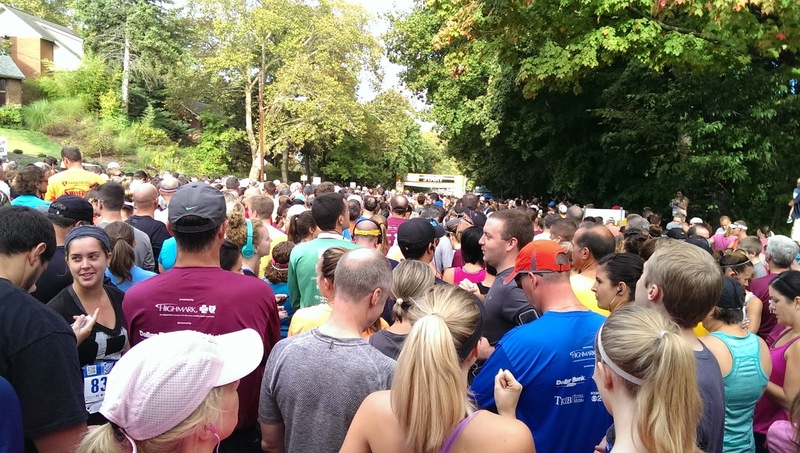 The starting line of this race is really odd; it is literally in a neighborhood. People were coming out of their homes, drinking coffee, and just staring at the thousands of people standing on their street. ...starting line with thousands of runners. 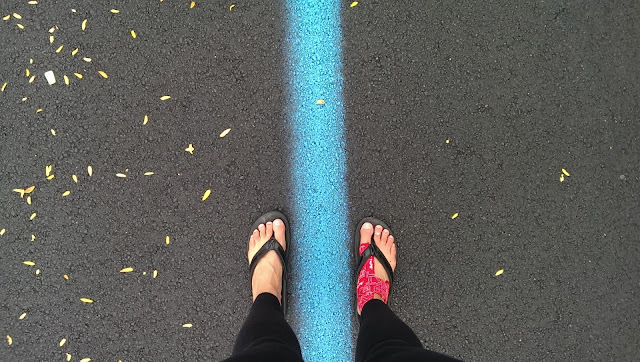 At the starting line, I decided that I was going to walk the entire race. I wasn't 100% about my foot but knew I wanted to try. Our friends spread out in the starting corral to what pace they wanted to run. Matthew and I said our goodbyes as he moved up towards the eight minute mile pacer. Gloria, Kelsey and I made our way to the back of the pack so we could start towards the last people as we didn't want to get trampled. My ipod had died that morning so I borrowed Steff's instead- I cued up her awesome running playlist and started my walk over the starting line. Probably my favorite picture of the entire race. Because I was worried about keeping up with the required pace, 14 minutes/mile, I was hustling that first mile- I think it was just under 13 minutes! Which was about my pace when I first started running five years ago! It was really, really difficult to NOT run. I was so excited to be racing and my foot was feeling great and it was so tough not to just break into a run. But I didn't run. Instead, I was power-walking the crap out of the Great Race. I was lost in the new music and the surroundings when around mile two, this man came up and started talking to me. I took my headphones out and he said, "You walk as fast as I run! Can I stay with you a while?" Obviously, you know my answer- "Of course!" I said to him. 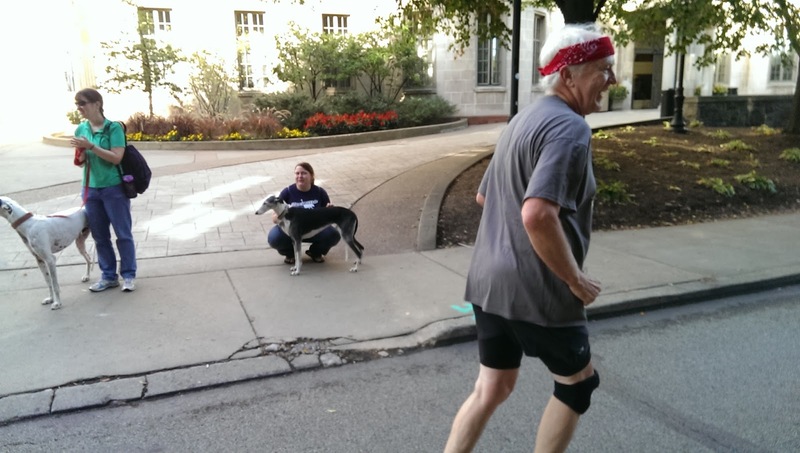 Jim became my new running buddy for the last four miles of the course. 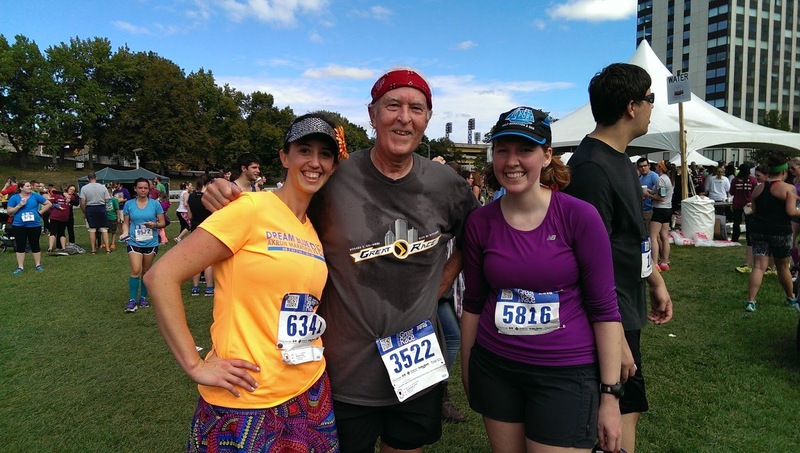 I learned all about his life (he's a professor for Pitt's medical school- moved here from the mid-west a long time ago), his wife (married for 30+ years), his son (studied art in college), and why he was running the Great Race. As it turns out, Jim was a runner for many years but eventually, his joints gave out on him and he could no longer run. He switched to cycling but in his mind, that doesn't compare to running- he runs the Great Race every year as his one running "indulgence." How cool is that? 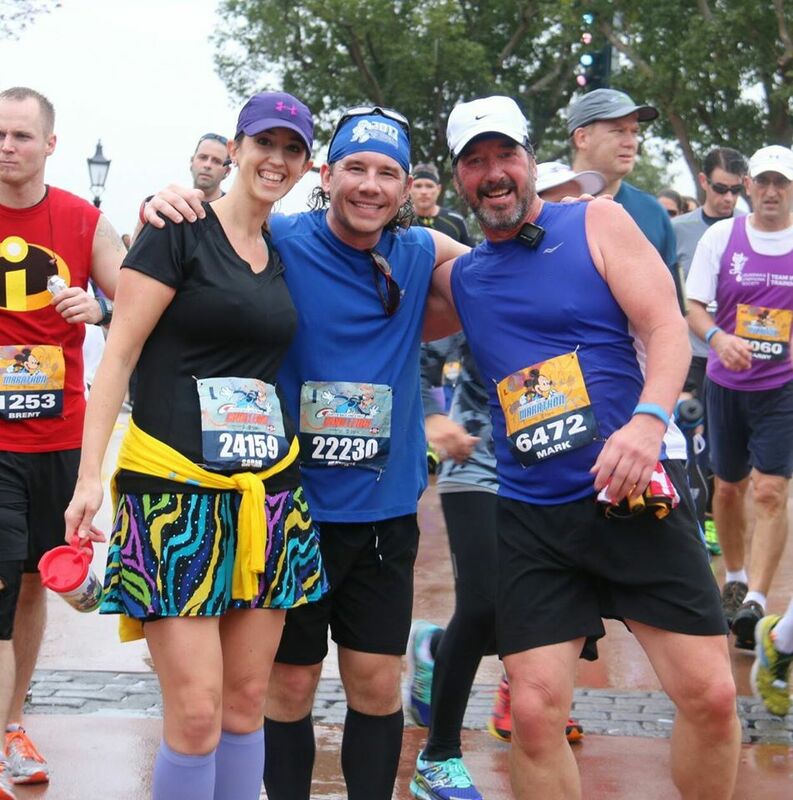 I cannot tell you how much I enjoyed this race- Jim running beside me, me walking fast to keep us on pace, chatting and laughing as the miles flew by. 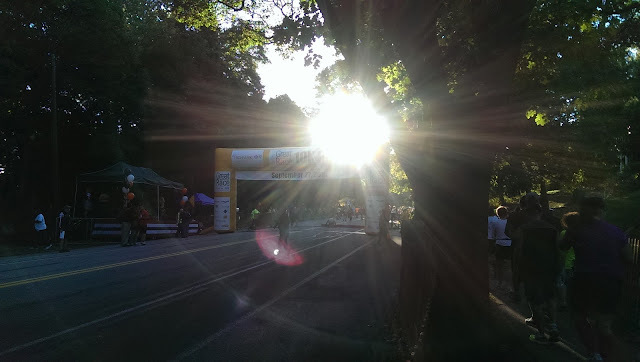 Parts of this course were very familiar to me as I've run in Pittsburgh a few times now. I knew some of the hills we'd face on the later part of the course towards the finish line. Even with the heat (it was crazy sunny and hot) and the hills, the course is beautiful and offers spectacular views of the city. And there were greyhounds on the course! Just like during the Pittsburgh Marathon! 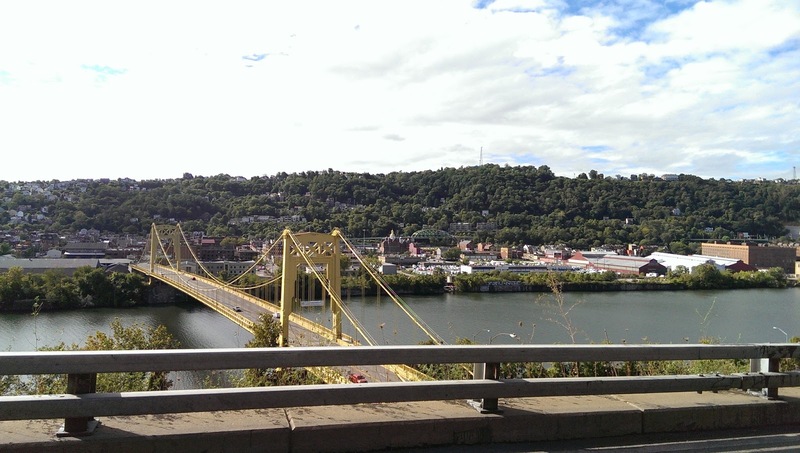 One of Pittsburgh's many bridges and river views. As we neared the finish, I spotted Kelsey making her way up the last hill. I introduced her to Jim and the three of us headed towards the last downhill of the race. Matthew had called me to let me know he'd finished and that he and some of our other friends were on the course waiting to cheer for us. As we neared the downtown area, I spotted Matthew, Coach Jeff, and a very pregnant Natalie on the sidewalk. 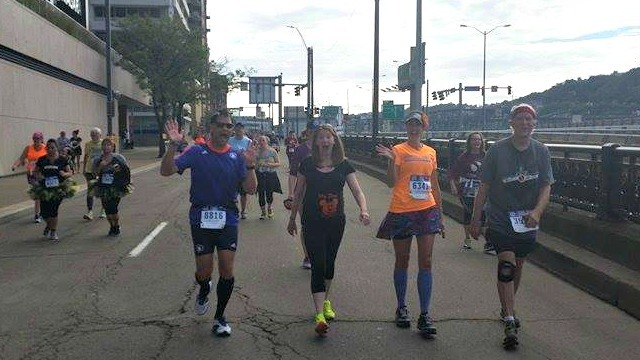 You may recall, Natalie had run the Akron Half Marathon the day before and I had stayed with her (and Coach Jeff and her husband Jimmy) for the first part of the course and my relay leg. Coach Jeff, Natalie, Me, and new friend Jim. We crossed the finish line, exchanged emails, grabbed a picture, and then headed to get some post-race snacks and water. I also ran into Elana again and we were able to get a picture on my phone. I always look creepy-happy when I meet readers in real life! We finished in 1:21:34 with a 13:07 average pace. And I WALKED! I can't tell you the last time I'd walked that much- probably during Dopey training two years ago. Walking is a totally different mechanical function- it's definitely not the same as running six miles and it definitely feels different in your legs, back, hips, etc. We found our running ohana, snapped a quick picture and then headed back to Steff's to shower and get on the road to home. 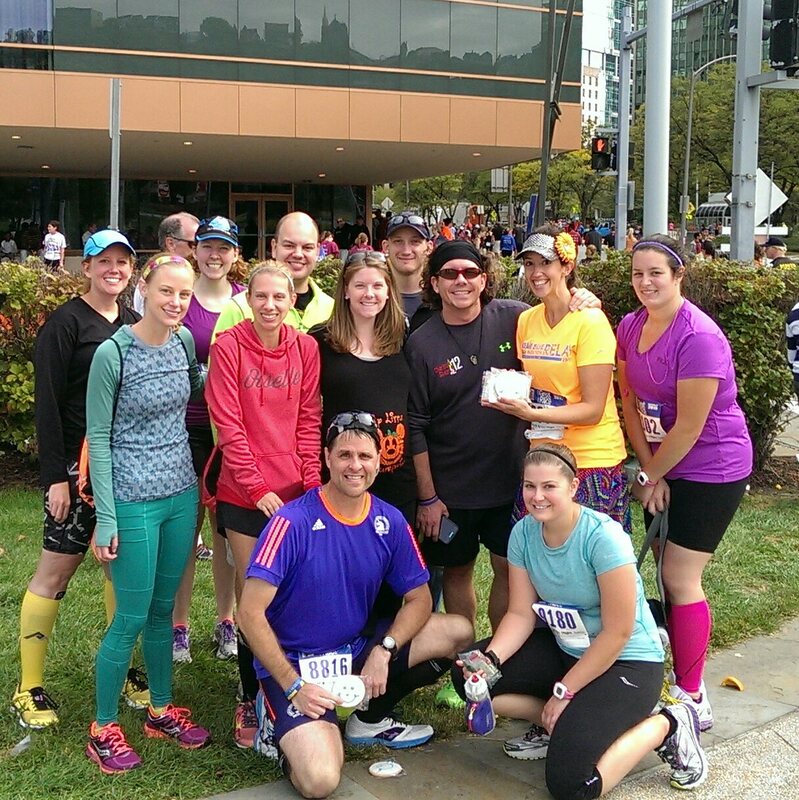 Have you ever participated in the Great Race or any other city-sponsored race? Welcome to the second-to-last Monday of 2015! If you follow me on Facebook or Instagram then you know that Matthew surprised me with a four night cruise on the Disney Dream last week! Isn't he just the most wonderful man?! I think so :-) Seriously, I think I might have the BEST future husband in the world- he's just so good to me. It was really awesome to be able to take a week off with him during the busyness of the holiday season and just enjoy being with each other and relaxing. The beautiful Disney Dream, all decked out for Christmas. 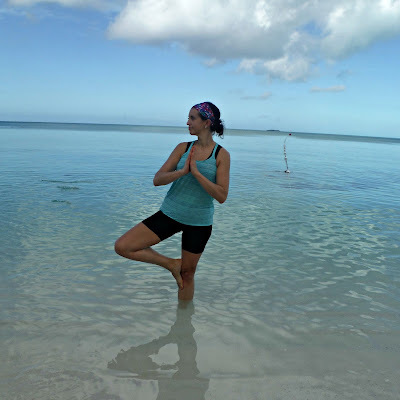 So this accountability post takes place while we were cruising on the high seas! I'll probably write a more detailed post about our entire cruise experience sometime in the future. Sidenote, I was in Instagram "jail" all of last week- I could post pictures but I couldn't add captions or comments to my or anyone else's photos. I have no idea how I ended up in jail but it finally ended late Saturday night. If you see any posts without captions, that was why. So weird. 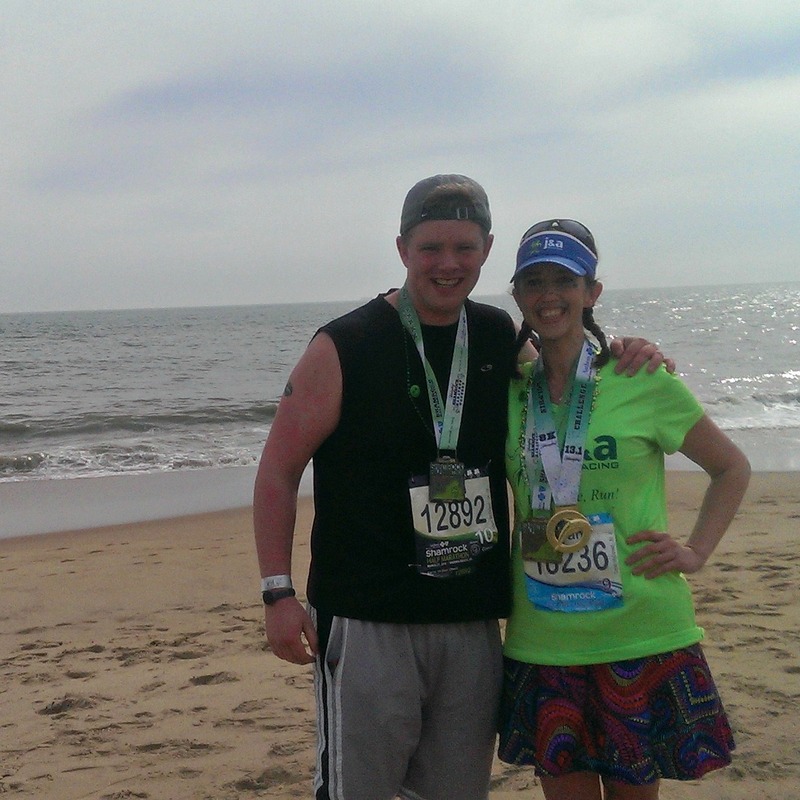 On Sunday, Jen and I kept what felt like a really easy pace- I figured we were running about 11:30- 12 minute miles. We were both shocked to see 10:34 as the overall pace as we both felt like this was an easy effort 4-miler. Hopefully this just means we are getting to be better and faster runners! 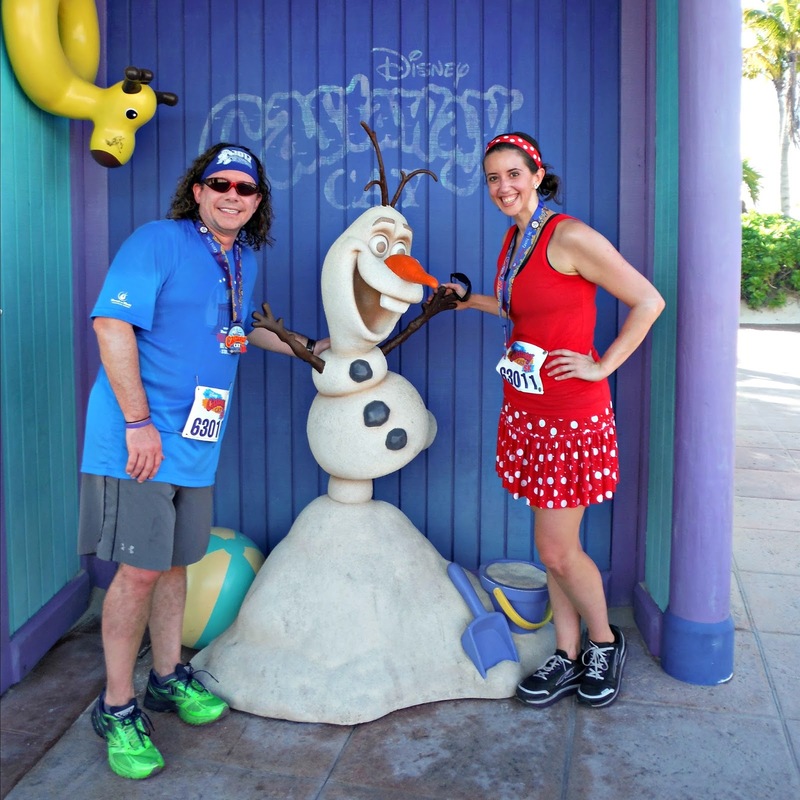 Finishers of the Castaway Cay 5k and our frosty friend Olaf. I made a similar dish to the one found here (Skinnytaste Cheeseburger Casserole) this weekend and it came out ok. Instead of pasta, the recipe I used called for sliced potatoes. It was definitely different from what I usually make and I'm looking forward to trying it again only using pasta this time. And adding pickles. Matthew and I took the stairs EVERY SINGLE DAY on the cruise, regularly walking from Deck 3 to Deck 14 and everywhere in between. We only took the elevator once and that was to move our luggage and to look at the inside of the elevator- there were Disney characters painted on the inside of the elevator shaft that we wanted to see. 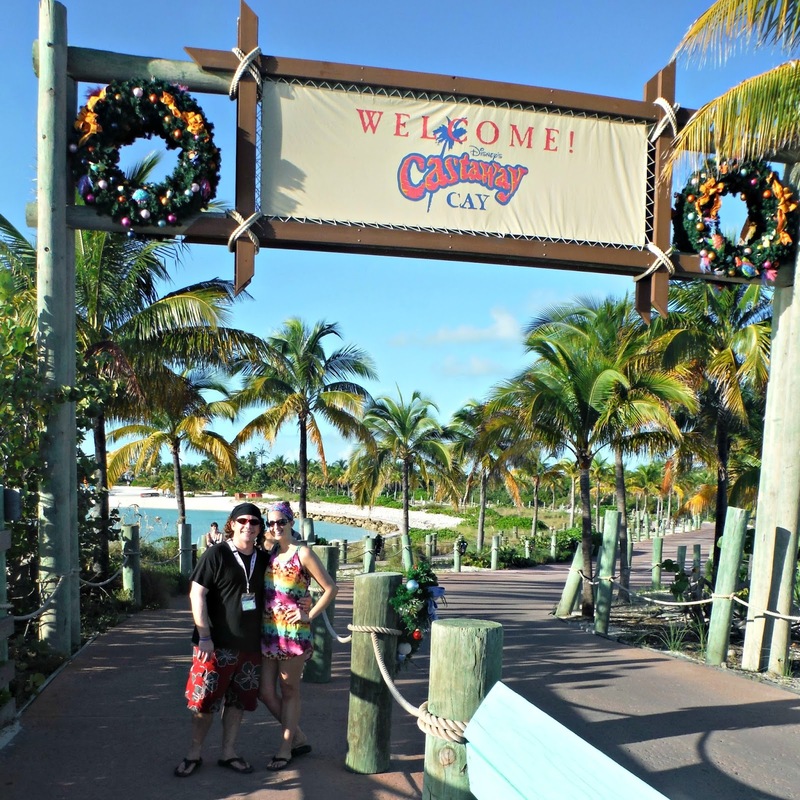 Hello from Disney's private island, Castaway Cay! Nothing like a little accountability to start off the weekend! In short, my last week was pretty dang awesome. Weight Watchers revealed a new program (Beyond the Scale), I completed training in Dallas, TX to become a Weight Watchers Leader, and I lost 2.8 pounds- even while I was traveling, which is usually challenging for me. 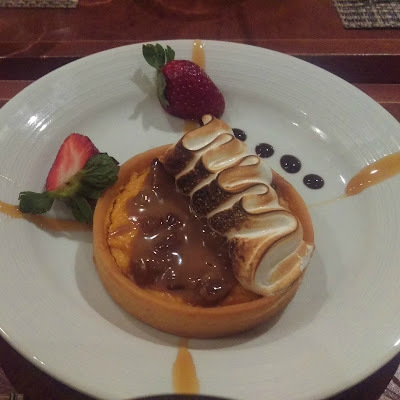 I've actually been living with Smart Points and Beyond the Scale for about two months now (as Service Providers we got a sneak peek at the program) and I can honestly say that I think it's the best change Weight Watchers has made in a long time. I plan on writing about this a bit more in detail in the coming weeks but overall, even though I struggled at the beginning, I am super excited about this program and how it will benefit so many people. Also, look for an upcoming post with all the fun stuff that happened at leader training this past weekend- in short, it was a transformative and developmental experience with some of the most inspirational women I've had the privilege to meet. 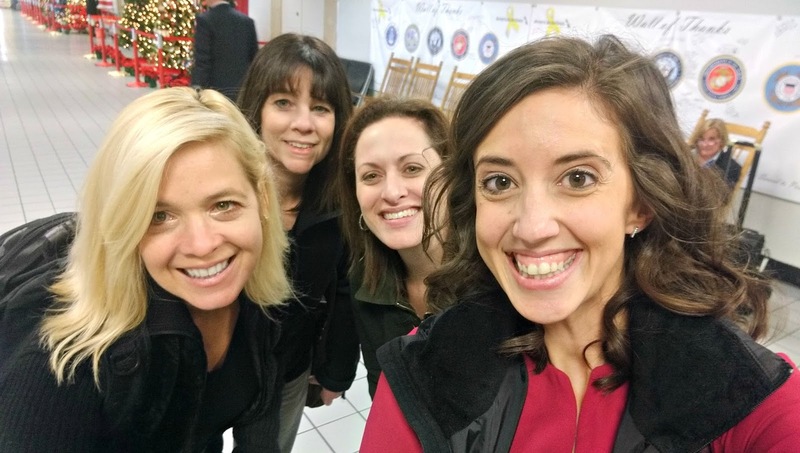 Future Weight Watcher Leaders: Rachel, Jennifer, Wendy, and me. 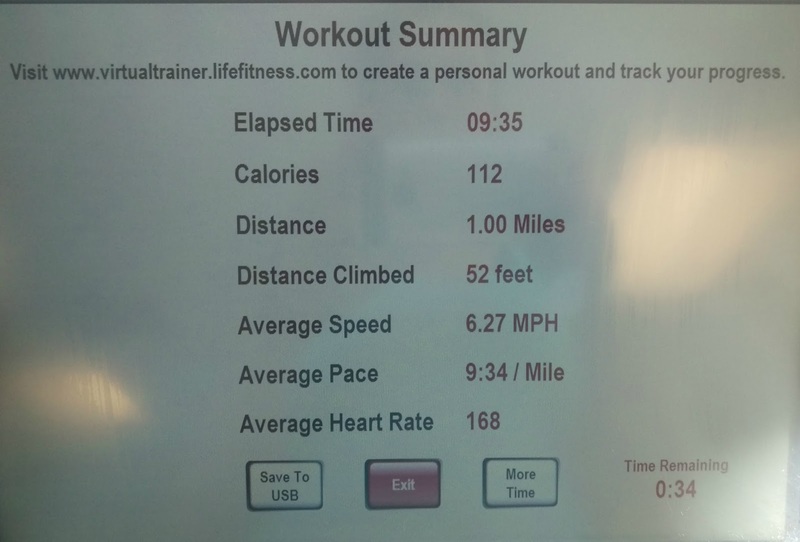 Galloway's Princess Half Marathon training plan called for eight miles on Saturday and even though I had to get them done on the treadmill, I felt confident in getting another long run under my belt. 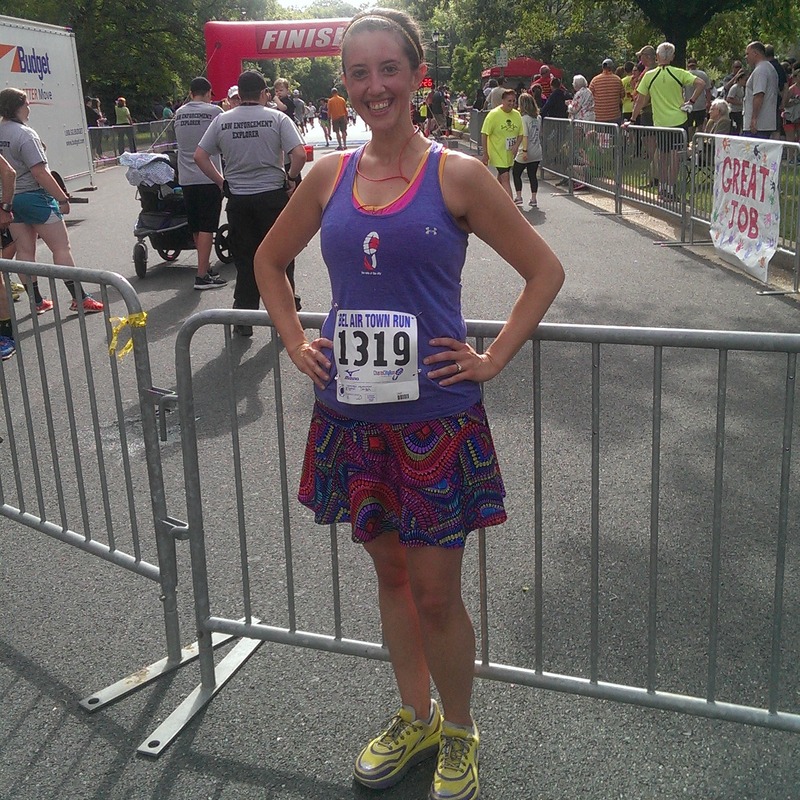 And the next day, my legs felt so good that I decided to crank out a 9:34 mile! But you'll notice that I've been a big-time slacker the rest of the week. On Sunday night, I ran up the opposite way on an escalator (long story) and I whacked the top of my right foot on one of the steps as it was coming down. Ouch. It's bruised and sore so I've been babying it all week. Luckily, there's only one mile on the training plan this weekend! 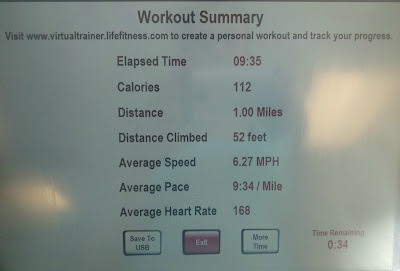 Proof of my fastest mile to date. Yesterday, at one of the many work holiday parties, I successfully walked away from a tray full of cookies and didn't look back. Progress. Happy Friday and Happy Hanukkah to all who celebrate! Have a splendid weekend! I feel like such a bad blogger- so much is going on in my life and I want to share it with you but finding the time to write is impossible! BUT- I did make a promise that I would post once a week until Christmas and I'm sticking to it. There are still tons of recaps I need to write (The Great Race, Philly RnR, Vegas RnR) and I'm looking forward to some time off over the holidays to write about all of them. Today I thought I'd do something different: Five Things Friday! Lots of my favorite bloggers do a weekly post like this (Steff, We Run Disney, Kathryn, Chelsea, Lauren) and I always love catching up with their lives in short form! 1. I fly to Dallas tonight! I may or may not have shared this but I recently was invited to become a Leader with Weight Watchers. Currently, I am a Receptionist and I really love it. WW is sending me to Dallas for Leader Training for a few days and I am so excited to learn more about my new role with the company. 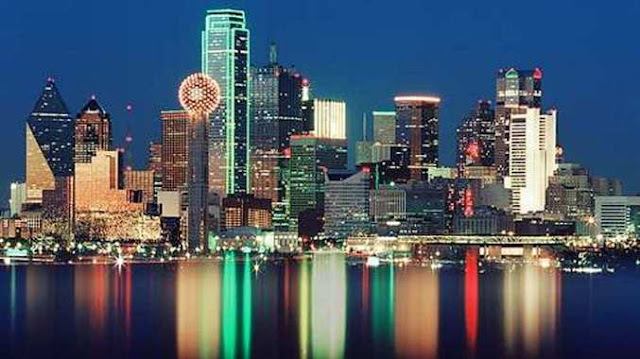 Random Dallas skyline picture from Google Images. 2. 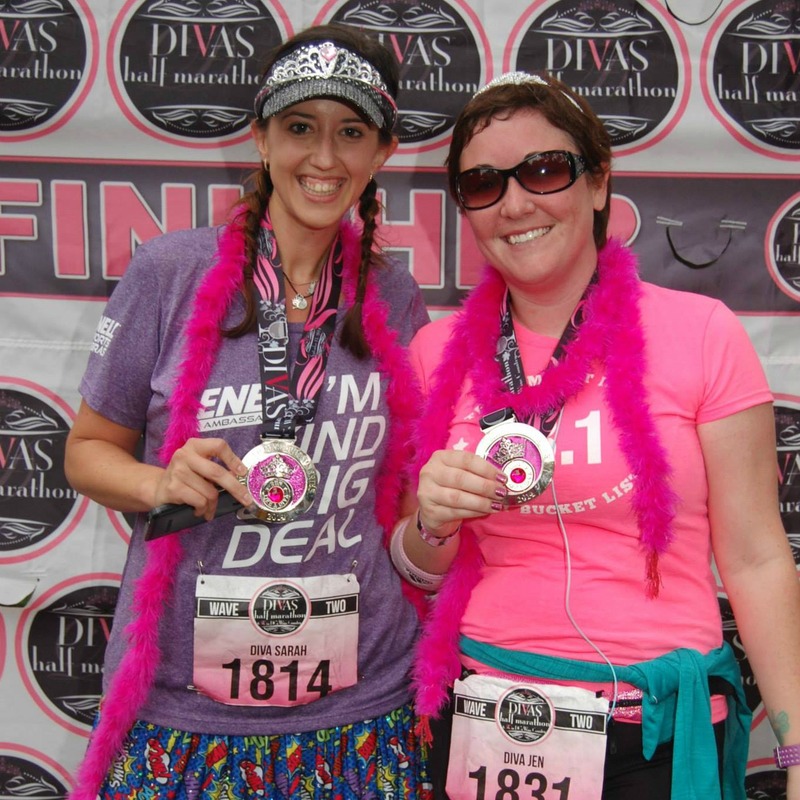 There's only 11 weeks until Princess Half Marathon. Holy crap. 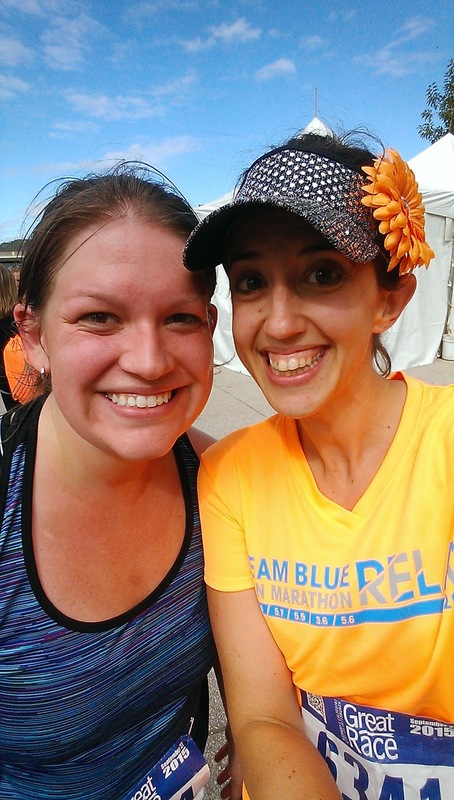 Jen and I only have 11 weeks to get our poop in a group for this half marathon! Luckily, I've been able to get in MOST of the weekly conditioning runs and ALL the long runs so far. I'm following Jeff Galloway's training plan for this half because I trust his methods and I know it's doable even with my hectic schedule. 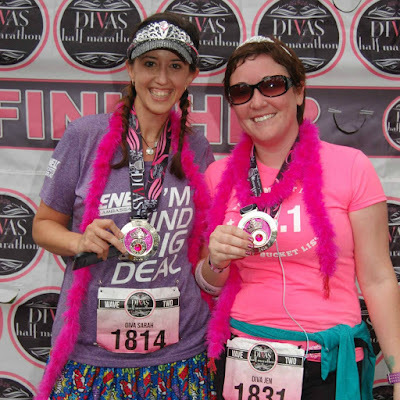 Jen and me at her first half, Divas DC in 2014. 3. I'm THISCLOSE to rounding out 400 miles run this year. Despite all my injuries, false starts, and general life craziness, I've run 391 miles in 2015- including three half marathons, one full marathon, three 10ks, 10 5ks, one 2 miler, one 12 miler, one 8k, and one marathon relay. Fingers crossed for more dipping in our collective future. 5. 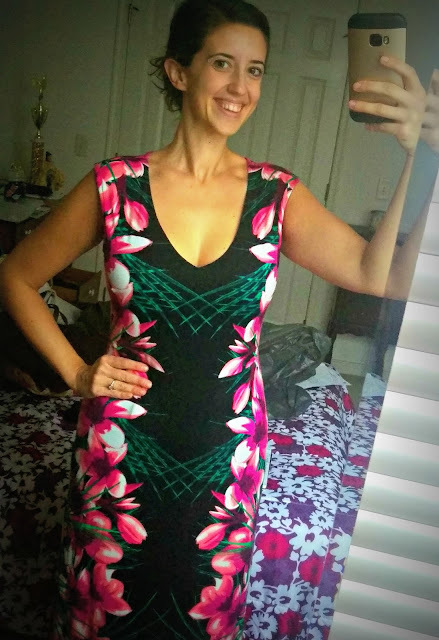 I bought this dress for $3.80. That has nothing to do with my fitness or weight loss; it's just a great deal (clearance at Kohl's). :-) And I really like the dress and needed an excuse to share a picture of it. I love shopping end-of-season clearance racks. Maxis are my absolute favorite. Have an awesome weekend, friends!